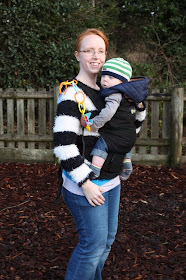 On Tuesday, Chantelle compared wraps and mei tais for the babywearing series. Today, our second guest blogger Donna is raving about her Boba 4G carrier - thanks Donna! I only carried my first child, LP, in a carrier a handful of times - I found it easier to use a pushchair, somewhere to put the change bag above anything else! But since having my Little Man I have found babywearing invaluable. I had two children 20 months apart and the eldest was new to walking so I looked for any ways to make my life easier. During pregnancy we bought a huge monster of a double buggy but when we started to use it as a double I found it so cumbersome - It wouldn't fit in the car boot unless I took all the wheels and footmuffs off and it didn't fit through our doorways at home. To make things easier I started to only use the double buggy when I was walking somewhere from home - About once a week, and the rest of the time I would drive somewhere and take a single pushchair and carry Little Man in my Close Caboo. Unfortunately though Little Man got too big for the Caboo very quickly so I borrowed a friend's Ergo and then was sent the Boba 4G to review - I haven't looked back! In hindsight I think I would still choose the Close Caboo from newborn as I love the stretchy wrap style but the Boba 4G is definitely my carrier of preference for long term usage. The Boba 4G is a structured baby carrier that has multiple straps and toggles to make sure that it fits you and your baby perfectly. It is suitable from 7lbs onwards and comes with a newborn insert to use when your baby is tiny - I know many other carrier manufacturers charge extra for a newborn insert. The Boba 4G also has a detachable hood to protect your baby from the elements but also to give it some support when sleeping and a high back makes it incredibly supportive when carrying your baby at any time. A few things that I love about the Boba 4G compared to other carriers are mainly the little details - It has a clip on the shoulder to attach your bag strap, camera strap or baby toys so that they don't fall off your shoulder. Detachable foot straps are included to give your child's legs support as they get bigger and the whole carrier is incredibly easy to put on and adjust by yourself. I honestly have nothing negative to say about the Boba 4G and if you're looking for a carrier that will last from newborn all the way into toddlerhood then the Boba 4G may well be for you! At times babywearing has saved my sanity, it's let Little Man sleep whilst I have my hands free to look after his sister and it's made shopping trips and running errands so much easier. There have been times where I don't know what I would have done without a baby carrier! Donna blogs at http://redheadbabyled.com, and you can also find her on Facebook and Twitter - Do pay her and visit and give her some love!